Recent and historic low-frequency, high-impact events have demonstrated the flood risks faced by exposed coastal areas in Europe. Coastal risks are likely to increase in the future. This projected increase in risk along coasts requires a re-evaluation of coastal Disaster Risk Reduction (DRR) strategies and measures. This part of the RISC-KIT Coastal Management Guide focus on DRR measures that are presented by the display of coastal features. But in order to be able to decide on the best possible measure, they have to be carefully evaluated. 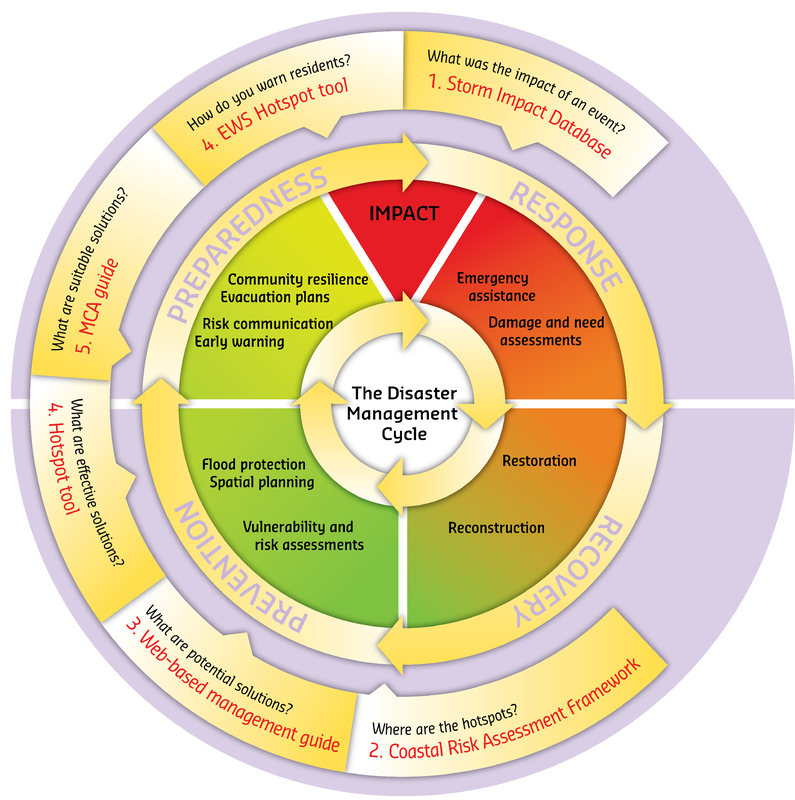 A Disaster risk management is a key element of the broader concept of resilience and can be defined as “the application of disaster risk reduction policies and strategies to prevent new disaster risk, reduce existing disaster risk and manage residual risk, contributing to the strengthening of resilience and reduction of disaster losses.” (UNSDIR 2017). One of the keys to understand coastal risk is to understand the different types of hazards that can occur in coastal and surrounding areas. The Disaster Risk Reduction management cycle illustrates the ongoing process to plan for and reduce the impact of disasters, react during and immediately following a disaster, and take steps to recover after a disaster has occurred. This web-guide focuses on the first part of the cycle: the planning and reducing the impacts by using prevention, mitigation and preparedness measures. The characteristic of the different measures are made more explicit in the differentiation between structural and non-structural measures and different coastal defense strategies. Flash floods: Flash floods are induced by heavy, often local, precipitation or sudden snow melt or combination of both. It is characterised by fast onset (minutes to hours after a causative event), a heavy multiplication of discharge and high flow velocities and is often accompanied by large sediment and debris flow. Estuarine floods: Estuarine floods are induced either by a costal flood whereby flood water is driven into the estuary or the incident of coastal and slow rise flooding meeting in the estuary. Urban floods: Urban floods or intra-urban floods are composed of storm water runoff induced by heavy precipitation on urban surfaces, and includes surface flood waves, internal flooding of areas and properties through overloaded sewer systems as well as through backing up of culverted and other water courses. Urban floods are characterised by fast onset, high dynamics of discharge and often uncertain pathways of the flood water. Erosion: Erosion is the process of wearing away material from the coastal profile due to imbalance in the supply and export of material from a certain section. It takes place in the form of scouring in the foot of the cliffs or in the foot of the dunes. Coast erosion takes place mainly during strong winds, high waves and high tides and storm surge conditions, and results in coastline retreat. The disaster risk management cycle (shown below) consists of four phases: Response, Recovery, Prevention and Preparedness. Focus of the RISC-KIT project lays mainly on the pre-disaster phase with tools that address Prevention/Mitigation and Preparedness aspects. This web-guide can be classified as a prevention tool by helping coastal stakeholders finding the right measures to prevent or mitigate damage or prepare for an effective response to the impact of hazards. Focus of this guide is not the presentation of response and/or recovery measures. Therefore, the presented measures in this guide are classified under prevention, mitigation, and preparedness measures. Measures can be distinguished between structural and non-structural measures. “Structural measures are any physical construction to reduce or avoid possible impacts of hazards, or the application of engineering techniques or technology to achieve hazard resistance and resilience in structures or systems. (…). “Common structural measures for disaster risk reduction include dams, flood levies, ocean wave barriers, earthquake-resistant construction and evacuation shelters. Common non-structural measures include building codes, land-use planning laws and their enforcement, research and assessment, information resources and public awareness programmes. Note that in civil and structural engineering, the term “structural” is used in a more restricted sense to mean just the load-bearing structure, and other parts such as wall cladding and interior fittings are termed “non-structural”. (UNISDR 2017) Furthermore, structural measures can be between an eco-system based approach, grey infrastructural approach (constructed assets built for example of concrete or steel), or a combined approach (grey and green approach). 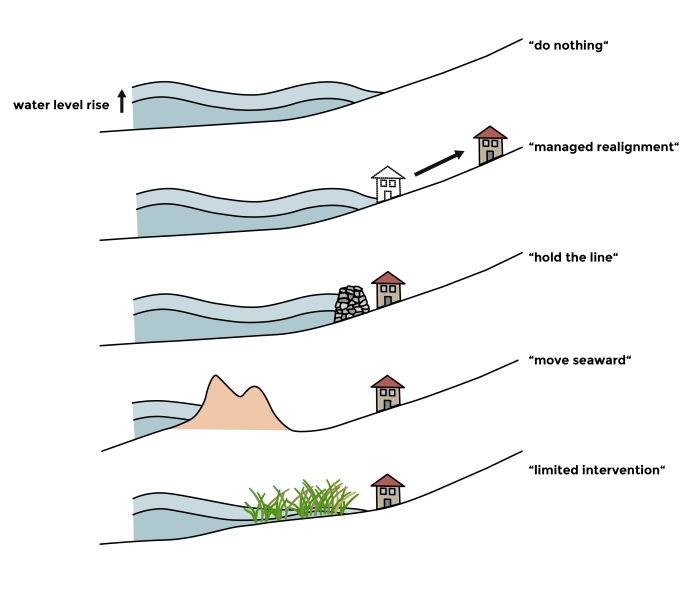 For the structural measures, there are five generic strategies for coastal defense (see below, based on Dronkers et al. 1990). J. Dronkers, J. T. E. Gilbert, L. W. Butler, J. J. Carey, J. Campbell, E. James , C. McKenzie, R. Misdorp, N. Quin, K. L. Ries, P. C. Schroder, J. R. Spradley, J. G. Titus, L. Vallianos & J. von Dadelszen (1990): STRATEGIES FOR ADAPTION TO SEA LEVEL RISE. Report of the IPCC Coastal Zone Management Subgroup: Intergovernmental Panel on Climate Change. Geneva: Intergovernmental Panel on Climate Change. European Comission (2013): Guidance for Reporting under the Floods Directive. United Nations International Strategy for Disaster Reduction (UNISDR) (2017): UNISDR Terminology on Disaster Risk Reduction. Ap van Dongeren, Paolo Ciavola, Grit Martinez, Christophe Viavattene, Tom Bogaard, Oscar Ferreira, Ruth Higgins, Robert McCall (forthcoming): Introduction to RISC-KIT: Resilience-increasing strategies for coasts. Submitted to Coastal Engineering.